6–make that 7!–NATURAL ways to get rid of nasssty cabbage moths!! 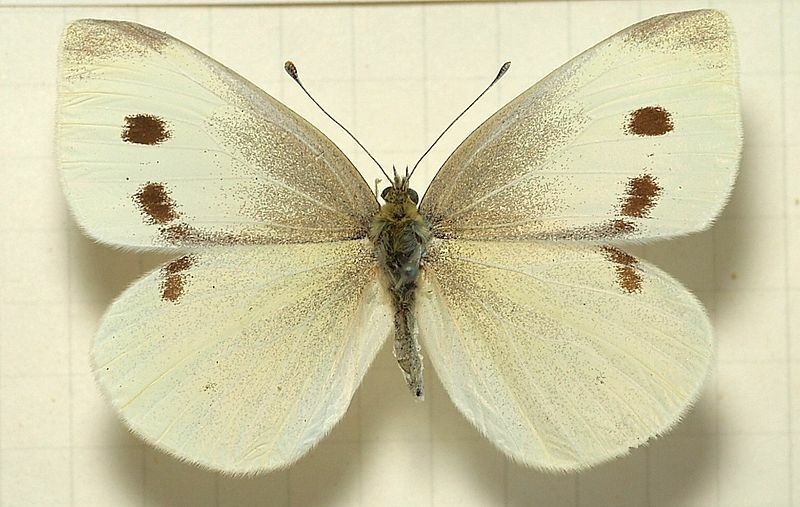 I don’t think very highly of the nitwit who accidentally introduced the Small White cabbage moth (Pieris rapae) to North America. No, indeed, I don’t. He is probably a cousin to the nut who introduced the starling to this continent, perhaps even a friend of the fool who introduced the House Sparrow–was it intentional? Was it an accident? Most agree that it wasn’t a great idea, in hindsight. None of these creatures are native to this continent, and they’ve all created unwelcome havoc to the native species. This dainty, fluttery little moth is wreaking havoc in my cabbage plants even as we speak, yes, Gentle Reader, this very moment. As soon as my back is turned, hundreds of these little moths (hey, right in front of me, even!) flutter amiably about my garden, laying eggs on all my cole crops, without so much as a “how-do-you-do-ma’am, thanks-for-the-breakfast.” Within days, the eggs (drat them) will hatch, and out will pop voracious little caterpillers, which will immediately and without invitation begin to eat holes in my lovely cabbages, my gorgeous kale leaves, and all the other brassicas in my garden. I have one word for them: Grrr. I was already viewing the onslaught of these pests a bit personally this summer, as I had noticed a larger number than I’d ever seen before in my garden. But then, when two of my good gardening friends, oh, nay, actually three, mentioned to me within 12 hours’ time how many Small White cabbage moths there were chewing up their cole crops this year, I decided that Something Must Be Done. There are times, of course, when garden pests must simply be plucked and thrown to the chickens (the tomato horn worm, for example) and other times when a pest can simply be ignored, as it doesn’t do enough damage to justify attention, and time is spent more productively in picking tomatoes, say, or green beans. This is not one of those times. Small White cabbage moths will make lace of your lovely kale leaves, or webs of your beautiful developing cabbages, in a very short time indeed. So. Let’s get started, Gentle Reader. The first thing, I believe, in preparing to battle any foe, is to find out (quickly, before the cabbages are lost!) what makes that enemy tick. 1.Unlike many other garden pests (my personal enemy, the Squash Borer Wasp, comes to mind) which have a limited cycle in the garden year, in North America this moth is continuously-brooded, being one of the first butterflies to emerge from the chrysalis in spring, and then actually flying until hard freeze in the fall. That’s patently unfair to gardeners who try to raise lovely brassicas without sprinkling or spraying with pesticides, like, for example, moi. 2. The caterpillars that hatch are green and well camouflaged, and live on the undersides of the leaves, thus making them less visible to predators. I, for one, do not appreciate a sneaky worm. The Small White cabbage moth: I, for one, do not appreciate a sneaky worm. 3. This fluttery little bit of white is also one of the most cold-hardy of the non-hibernating butterflies, occasionally seen emerging during mid-winter mild spells in cities as far north as Washington, D.C., which I consider very poor taste indeed. Like any unwelcome company, there comes a time for the Small White cabbage moth to just leave, already. Apparently nobody has ever taken the time to clue the moth in to this obvious fact. 4. I think we can conclude that this boorish pest has no manners at all. 5. These moths also have the nerve to be strong and hardy flyers, which annoys the heck out of me. Doesn’t it IRK you, too? Gosh. They have everything going for them. You certainly can see the large hole that this cabbage moth caterpillar has eaten in this kale leaf. The caterpillar itself is harder to spot—see it? So! Now you’ve got a good idea of what we are up against. Now, before we make our battle plant, let me show you what we are NOT up against. When I went out into my garden to take a few pictures of cabbage moth caterpillars and the damage they’ve done, I spotted this poor little lacinato kale plant first. A-ha! said I. “That’s the worst one I’ve seen yet!” I took a picture. “Perfect.” Thank you, cabbage moth caterpillar, thought I, for doing such excellent damage to this plant, so I can share it with my Gentle Readers. . .
You can see that the larger leaves are stripped nearly down to the center ribs. And then! I turned over the leaves, to find the hungry little fella himself, and found–Whoa, Nelly!! This is NOT a cabbage moth caterpillar! The lovely creature I found making delicate lacework of my lacinato kale plant was actually the beautiful caterpillar of the Black Swallowtail (or American Swallowtail) (Papilio polyxenes) butterfly! So . . . I didn’t squish the jewel-like creature, but instead carefully moved it over to my prosperous volunteer dill patch. “Eat away!” I urged it. I have lots of dill, more than I can use, so he’s welcome to it. I’m all for encouraging butterfly populations! 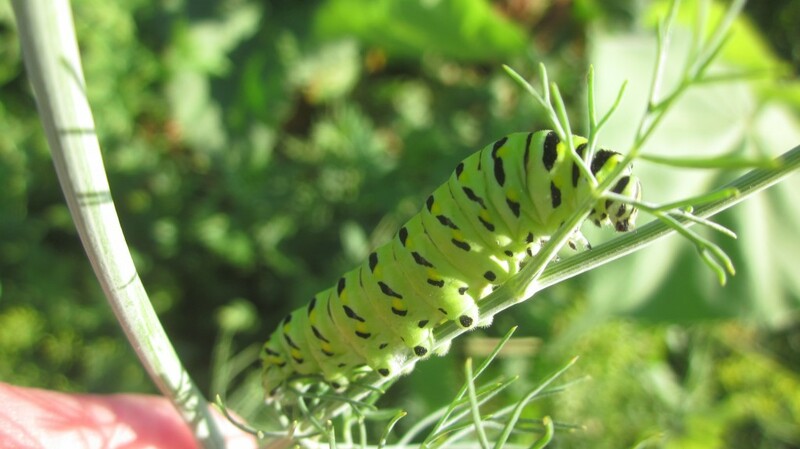 Here’s the Black Swallowtail caterpillar, now happily munching on my dill, with my blessing. 🙂 Happy caterpillar. Happy me. Of course, as soon as I told little Mack about the caterpillar, he grabbed a gallon pickle jar (empty of pickles, of course) and set up his caterpillar habitat, and then he flew out to my garden (not literally) and found this caterpillar, promptly named him “Jerry” and established him (and three cousins!) into his new habitat on the back porch. They’re busily munching on dill and thinking about building chrysalises (chrysalii? ), last I checked. 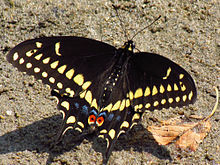 Here’s a beautiful Black Swallowtail butterfly. Okay, now back to our vile enemy, the Small White cabbage moth: I’ve been doing an informal survey on what other organically-minded gardeners are doing to battle with this innocuous-looking, yet noxious and hungry pest, and I’ve compiled a list of 7 things you can do to cheat the Small White and its hungry brood of its lunch. And dinner. And breakfast, for that matter. Then I found one more. So let’s get started. 2. This same friend also makes a solution of crushed hot peppers (not too hot, she says, or you’ll burn the plants) and sprays it liberally on the cole crops. You can also use crushed pepper flakes: bring one gallon of water and 3 Tb of crushed pepper flakes to a boil and simmer for 10-15 minutes. Let sit overnight, and load up your sprayer! Be careful when you’re doing this: the air in your kitchen will be painful! 3. Similarly, a solution of chili powder and garlic is said to repel the cabbage moths: Crush and mince 3 cloves of fresh garlic in 2 Tb olive oil, add 1 Tb chili powder, and add to 1 gallon of water. Let sit for 24 hours or more, and you’re good to go! 4. Are you plants already infested? (If you’re reading this, the answer is probably a moaning YES)– Then here is your fix: spray them liberally with a Bt solution. This stuff works, folks. Bt is a biological insecticide (actually a bacterium that only infects caterpillars) that will control an existing cabbage worm problem. And it couldn’t be simpler: Spray the leaves, all surfaces, with Bt solution. 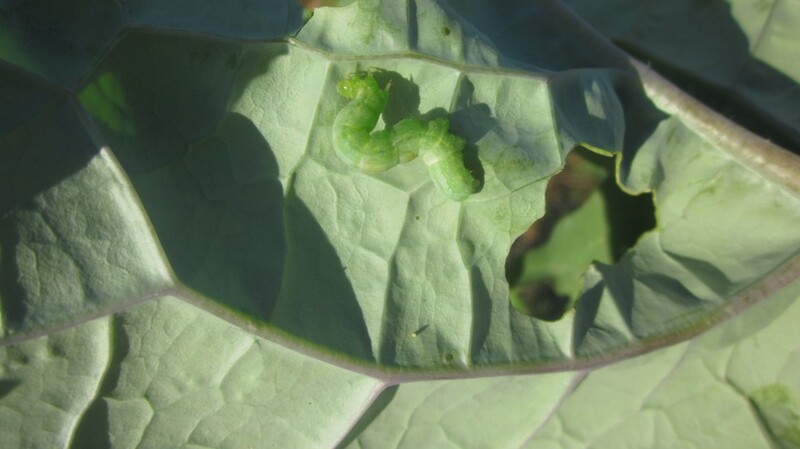 The cabbage worms will eat the leaves and become infected by the Bt. The good news: the infection will kill the cabbage worms. The bad news: it won’t kill the adult moths or any eggs they may have laid on your plants. One common brand name is Dipel, which you can order easily–right–here. I’ve used this before; I keep it in my stock of garden tricks and tools, and it is reassuringly effective. This stuff works. I keep it on hand all garden season long. 5. If you don’t have a problem already, use a floating row cover to keep the moths out of your cabbages and broccoli. If they can’t get to ’em, they can’t eat ’em. My gardening friend Erin says that these work like a charm, but you have to get the cover into place when the plants are small, and the cabbage moths haven’t found them yet. Actually, this spring I spread out wide swaths of floating row cover on ALL my cole crops, and have tried to keep them in place all season so far, and I’ve seen very few little white devilish moths. 🙂 Occasionally I pull them back to pull weeds and check the progress of my plants. It works great, although you do have to watch them during storms, that they aren’t jerked up by the wind and taken to the next county. And it is most effective if you get them in place before the dainty white moths show up in the first place. I love, love, love this stuff and use it to cover other crops, too, to protect against insects. 6. Do practice crop rotation from year to year. 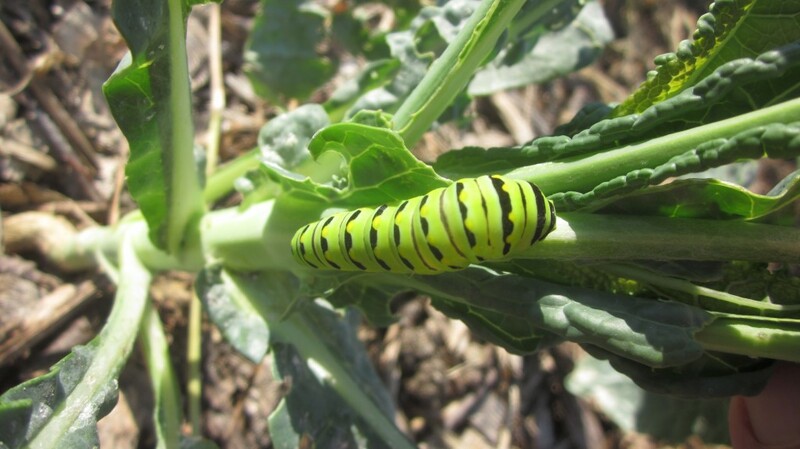 Don’t plant your cole crops in the same spot every year, for example, or your cabbage moth problem will get bigger and bigger from year to year. This is sound advice for every crop, by the way. And: you’re welcome. 🙂 That’s a freebie. There you go, Gentle Reader. 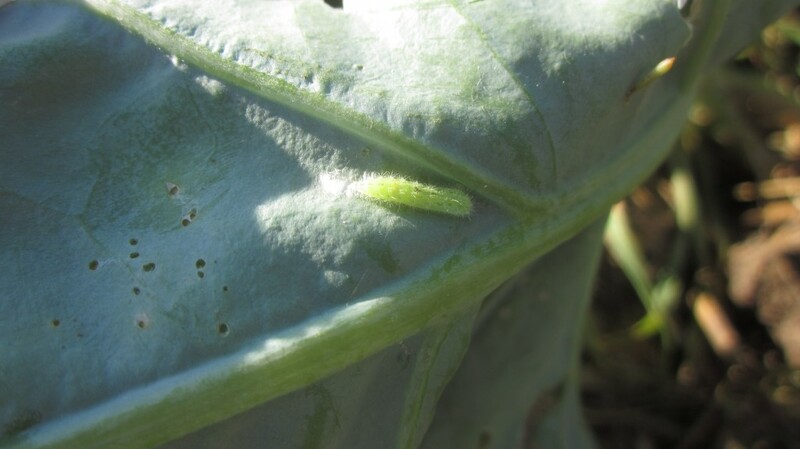 From my experience and research, the tried and true cabbage moth control tips in this post are the most effective cabbage worm control strategies available. Since the sneaky and hardy cabbage worm can develop resistance to insecticides, organic controls are often used by conventional gardeners and professional vegetable growers as well as by die-hard organic gardeners. So we are in good company, aren’t we? Here’s a tiny cabbage moth caterpillar–isn’t it so cute? (NOT!) Grrr. Now go out and arm yourself, Gentle Reader: order the Bt and the sprayer, or the bug zapper or the row covers (or all three!) and prepare yourself for battle! Onward, and–Courage! I’m right here with you in the trenches. Tagged on: cabbage moth caterpillar control, how do I identify cabbage moth and caterpillar?, how to control cabbage moths, How to get rid of little white moths in my garden, natural cabbage pest control, natural pest control in your garden, natural ways to get rid of cabbage moths, organic cabbage moth control, what are the little white moths in my garden? ← Spicy pumpkin pie coconut coffee! Pretty yet destructive creature. I am glad that my old favorite, spice, can help to get rid of them! THANKS for sharing. besides the anticipated onslaught (based on prior experience/years) the catalyst prompting this long over due research was an article in the San Francisco Chronicle (19 March, 2017) written by Earl Nickel and titled “Being a good host in Butterfly season”. I have used “Safer” products previously but I am of limited means, so this is where I have arrived pleasantly and appreciatively. As an aside, these prolifically multiplying bastards decimate/destroy/ eat/feast on all the flowers on my nasturtiums and geraniums, so it’s not just veggies. Making a little more effort these days is especially critical considering the COLONY COLLAPSE CRSIS taking place with the bees. The home made remedies you introduce are not really that much of a chore and the dividends are huge. I hope everyone will be more mindful as they go about their gardening. For any who need more insight on being responsible garden stewards, go to the library, the book is titled “Silent Spring” written by Racheal Carson. I just read this article after I carefully mixed up the beer and molasses treat. I was wondering if it will do any good now? I have some hole-y leaves but the second planting is just starting to be edible. Also when do I spray? Evening or morning. This week is very hot for us like 90′ to 108′ should I wait for cooler weather?? Love your blog! It’s my go-to now!! Karen, I would definitely go ahead and spray the buggars now. And early and late. And after a rain. Those cabbage moths are ubiquitous all over the world, and their season is very, very long. So you are not at all too late to begin some defensive maneuvers! Great article. I love how you infuse your personality in your writing! And, great tips, too. I shared your article. So glad I had the opportunity to visit your blog again today! Thanks Deanna for your sweet comment! Aww. This just makes my day. I love this: “a touch of silly” hehee! I guarantee that you’ll get hooked! They’re quite pretty! But not good if they are causing that much destruction! What a nightmare! They are voracious little beasts, aren’t they, Sophie? Oh the joys of gardening. Hope you get ahead of your unwelcome visitors. I know the pains of fighting a tiny enemy. In my case they normally won the battle. Blah. I plan to win this battle, Shawn! I’ve got a gallon of hot pepper spray ready to use tomorrow! I’ll keep you posted! You’re so funny, Anita-Clare. Do you really say “hot dang” there in the merry ole’ country? I’m quite certain I’ll get those nasty moths sorted out! Shame something so pretty is so destructive. Do you think diatomaceous earth would work? I don’t know about diatomaceous earth, but it would be worth a try! And stink bugs are another import??? That figures! We have them in great abundance here, sadly! They are just voracious little bugs. Teri, I’m trying a new tack this year and I’ll let you know if it works: I’m going to plant cabbages and so forth inside in flats, and not put them out until mid-July, thereby (hopefully!!) missing the cabbage worm season entirely! I’ll let you know if this rash action works!! My new plan was to form structures to cover the plants and use row covers as a barrier. My front yard is a tiny garden patch and I’d use old lamp shades to hold the row cover material over my precious kale. But I may try some of these recipes first! Hopefully they aren’t as necessary in the Fall garden. Hi – Just wondering if the yellow bits of wood with the petroleum jelly worked? I’ve heard of several people trying this method this year, but cannot seem to find results either for or against. Thanks. NO, Shay, my friend shared with me that those sticky traps DID NOT work. In retrospect, I think I should have just put a floating row cover on my brassicas (you can buy this from garden supply sources) and have been done with it! That’s what I’ll do next summer, and that’s what I’d advise, if you want to stay away from the toxic pesticides! Just wondering if your friend’s sticky yellow traps worked? The moths have started to visit in downunder…. I need to write a P.S. to that post! No, my friend shared with me that her yellow sticky traps DID NOT work, so don’t waste your time with them! Here is what I will do next summer: (cabbage moths have been a pain here in Nebraska all season long!) once my cabbage, kale, cauliflower, etc., plants come up, I will cover them with a lightweight row cover (you can buy it from garden companies). I think that’s probably the best solution to these pests if you don’t want to use toxic chemicals. Bt is a bad idea, because it kills ALL caterpillars – monarchs, swallowtails, etc. Ah, thanks for pointing that out, Beverly! Row covers are good but inevitably they change the climate under the cover.The cabbages that I had under row covers are much smaller than their neighbors that I transplanted a few feet away, that are not covered. The cabbage it seems didn’t like the extra heat though I made sure they had plenty of moisture, the uncovered transplants outperformed their protected sisters. I sprinkle wood ash on my radishes and cabbages for rootmaggots, reapplying after rain. I’m hoping the ashes will work on the cabbage worms, I don’t have accessto domatacious earth here in Ecuador. I used to garden in Northern Alberta…I will certainly try the pepper spray. Thanks! I hope it works for you–it did seem to make a difference in my garden. Be careful, though. Apply it with a light hand, or you could burn the leaves. That was my discovery. Yes they got to my broccoli last year and I have a very small container garden on my back porch in NE DC!! I was stunned to have a pest in the city but they LAID WASTE to my poor broccoli. I used a concotion of tea tree and dishwashing liquid in water which wasn’t too strong to kill the broccoli but I did have to spray every day. It only kills the caterpillar. It was my first attempt at gardening and they will not affect me this year. Going to plant some mint and oregano early and get some covers. Thanks so much for this article, I feel ready to defend my garden this year! If the number of views of my “cabbage moth” post is any indication, I’d say that last year was a GREAT year for cabbage moths! Good luck on your protective measures, and I’d love to hear if any of the things you do help! All the best to you and your gardening this year! I’m hard in this battle already this year, I was told to mix 2 tablespoons of castle soap in a squirt bottle with a little garlic juice and spray this all over, top and bottom, my leafy greens. I found some cabbage moth caterpillars and within a minute of being hit with that soapy water they were hanging upside dead~!!!. I was so excited that I ignored everything for a couple days, went back out yesterday as a cabbage moth gently fluttered by me and entered my kale, by the time I got there it was fluttering away after, I’m sure, laying an egg or two on my beautiful organic kale!!!!! To the spray bottle!! This time maybe with a tsp of oil to help it stay on the leaf!!!! In the beginning of the spring, it is so nice to be able to walk out to the garden and eat a leaf or two of fresh kale and other leafy greens. That sure doesn’t last! Now, anything I eat from the garden has to be rinsed of what ever concoction I have sprayed on them…. 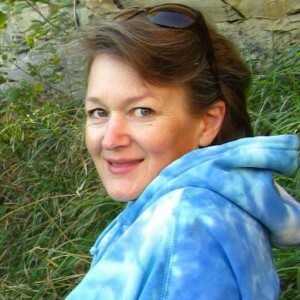 Thanks so much, Marcella Smith. It IS possible to keep the cabbage worms away, but it sure does take diligence, doesn’t it?? I read recently that if you wait until July 15 to plant your cabbages and kale and such, that you can avoid the little beasties altogether . . . but I’m quite sure I saw those little moths fluttering around nearly until frost last year! I have used Neem Oil on my leafy green crops but after it rains, it needs to be re-applied. The solutions that you have suggested sounds good, but does the rain wash it off also and needs to be re-applied? This year I made insect repellant “cages” that have protected them with some success, the leafy greens that I did cover weren’t affected much but the ones I didn’t get built in time to cover them with got eaten up. The problem with my “cages” is I built them 18″ wide and 18″ tall so my plants grew so quickly I had to take them off sooner than I expected. I am working on a different type of cage that may solve that problem. Please let me know about what you use to spray your veggies with and how the rain affects the application, Thank You! I use a Hudson trombone sprayer that my husband bought for me as a gift several years ago. “Happy birthday, honey, here’s your new garden sprayer.” I mix up whatever I’m going to spray into a 5-gallon bucket, and then use the trombone sprayer from it. It works really well. And Yes, you do have to reapply the spray after rain (or the sprinkler) washes your leaves, unfortunately. I just sprayed my kale this morning with B+ (Dipel, link in cabbage moth post) because the cabbage moths finally found my brassicas. 🙁 Here’s a link to the trombone sprayer, and GOOD LUCK! Cabbage moths are one of my most challenging pests! Thanks for the reply, I kind of figured that the rain would wash off any kind of spray that could be used, so at this point I think I will continue using the neem oil (at least til it’s gone). I am currently working on a new type of cage that should protect the plants from seedlings to harvest, ones that will be permanent but have access to the plant. You were also correct about how long the cabbage moths are around, it seems here in Ohio they are here more so after July 15th! I looked at your tomato cages and found them to be an excellent idea that I will incorporate into my garden next year you said, tomato cages just will not support the weight of the plants themselves (I found out the hard way), lesson learned. Keep up the great work, I appreciate it! I just tried method #2 with a mixture of dishwashing liquid, beer, fish emulsion and water and it seems to dissolve the caterpillars! Smells odd but I can tolerate that to keep my Kale intact. Thanks for the suggestions. I’m so glad! I’m going to mix up a batch myself. The cabbage moths finally found all my brassicas, doggonit! Thank you for your informative post on killing caterpillars. I have read all comments to the post and using a soapy spray seems the best idea. I have also read about this treatment before, but how much liquid washing up soap should be mixed with a gallon of water? I want to use enough to kill the Caterpillars, but don’t want to be foaming at the mouth every time I eat cabbage. John, I think I’d err on the side of “soapier” because–let’s face it–you can always rinse the cabbage to get ride of the soap! And I’m going to talk with my friend next week and get her “recipe” for this (just looking back at that post, I can’t believe I didn’t write the recipe in there) although I don’t think the proportions are all that important, as long as you just get all those components in there. I had to ask our hardware man to order me the fish emulsion—he had no idea what it was. Good luck!! Dill in with the squash has made it worthwhile and incredibly satisfying. Plants all used to die after setting fruit and getting pretty big, now the challenge is being quiet so people don’t hear the “squash lady” coming to pass out the wheelbarrows of squash! When the whites are mating they are particularly slow and easy to knock out of the air and send them on to their next incarnation. Or knock them down with a strong garden hose spray and compost them on the spot. Ya gotta go out in the garden often and keep an eye on things or they get out of hand pretty quick. I so agree! Daily garden walks (with enough time to DO something about potential problems!) are very important! I’ve had a long fight with these critters. I’ve read that they have no natural enemies. Not so. Paper wasps will eat the worms. I witnessed a wasp tear the wings off a dead adult and eat the body. I would kill (with a fly swatter) dozens of them at one setting and put them on the heads of cabbage. The next day I couldn’t find any of them except for the wings!!! Also, saw wasp on the cabbage heads and couldn’t figure why they were there. Turns out they were crawling under the leaves and coming up with the worms and eating them. After harvesting the heads, I found hardly any damage from these, as I call them, “white devils”. Slugs did more damage to the heads. Unless someone is allergic to their stings I’d import some paper wasps. Thanks David, do you have a source for the paper wasps? I’ve learned more about cabbage moths since I wrote this post, and I plan to edit it with that info. I’d sure appreciate your help with the source. Thank you for your comment! sure is difficult to get rid of those critters. spray water on them all the time. they have nine lives. Used neem oil. will try one of the methods. I’m currently trialing solar butterflies – seems to be working. I have seen a couple in my garden trying to attack or scare them away furiously and then giving up and flying away. I saw them at the reject shop and also on ebay. I will let you know how I go! PLEASE do keep me posted, Amelia! What the heck are solar butterflies and how do they attack the white moth? Grrr..indeed! This is the kind of pests that are naturally annoying. and they can be really itchy so i sprinkle them off the plants. Grrr, indeed. They do so much damage, too, Kaye, if you don’t keep on top of them. Cabbage lace, anybody? I hate those little white moths as well. I have watched them eat up my cole crops. This year was the worst year for them. I hand squished the caterpillars, which brought me joy to watch them squish all over the leaves. I left their squished carcasses on the leaves as a deterrent to any other caterpillars that think they may want to dine there. To get revenge on the flying moths… I have a little secret weapon. Now this will be exercise and you may look really silly doing it. It works well but your neighbors will surely think you have lost your mind and you might find videos of yourself circling around the internet doing this. Here goes. Buy yourself one or two of those $5-10 battery powered bug zappers that look like a tennis racket, and you guessed it… SWING AWAY. It feels good to hear zap crackle and pop when you hit them. the moths flight pattern is unpredictable so you will miss a lot, but when they land or get close to your plants…..be ready to hit them as they fly off. Also works good with with white fly. Wow. Cheryl. That’s brilliant. I’m going to get myself one of those before next summer, and I’ll add a link to one on my post, too. Hats off to you, my dear! Thanks, Carol. I’ll pass that along. In the Midwest USA, we have lots of wasps, they build hanging nests from the overhangs of houses and such. The adults eat nectar as their food source (while causally pollinating the flowers), but the babies or pupa, eat bugs and caterpillars as those fat babies in there nest are hungry and carnivorous! What does that mean Auntie Marcella?…It means they EAT YOUR PEST BUGS and FASTER THAN ANY OTHER, BECAUSE ALL THE HELPER COLONY FLYING WASPS JOBS ARE FINDING BUGS ALL DAY LONG, TOO FEED MOMMA’S BABIES!!!!! I learnt a few years ago too really like wasps as if you watch them they will go into your garden searching every kale leaf, every cabbage leaf everything for white moth caterpillars, tomato horn caterpillars, all of them! And when they find one you can watch them carry it away to their nests to feed its young. Last year I had 1-2 that would come to my raised bed close to my house, in the beginning the plants were getting slaughtered by bugs and caterpillars, then I noticed I had a couple wasps, within a week everything started to look better, my kale was growing without holes, it was great. They will even come close to you and look at you, if you stand still you can see them just checking you out, if you do not bat your hands at them then they go on, they are just trying to decide whether or not to check you for caterpillars, haha, but if you swing at them to shoo them away, well, they think you are trying to hurt them and will sting. you must view them as your helper. If I come to look at a plant that they are going over they will actually move to the next plant until I’m done doing what I’m doing, and then move back to the exact spot they left, checking every mm of those leaves for bugs! They truly are friendly if you are….Sadly though, about a month later they disappeared and the caterpillars moved back in. I’m pretty sure where ever their nest was it had gotten destroyed, I live in the suburbs and people are nuts about wasps and would have killed them if they found them. Sad as these are the best gardener friends ever created! 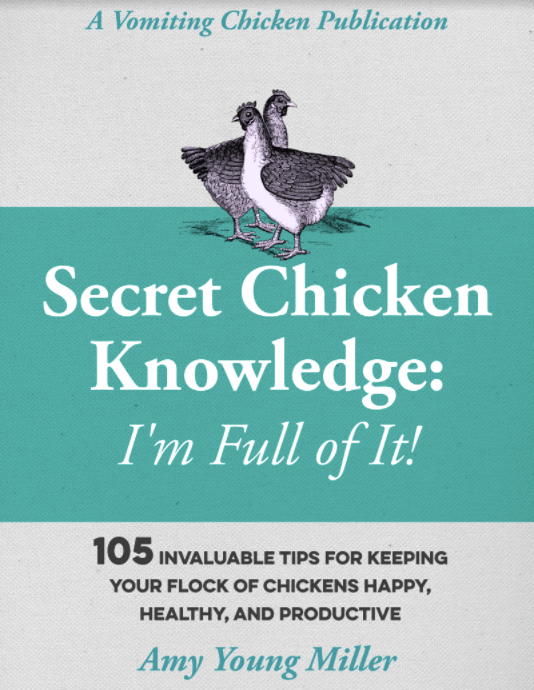 What–do–you–know??! I have never heard this before. We do have wasps that nest under the eaves of our home, but our garden is really a good jaunt away from our house. It has taken careful watching for you to notice this pest ecosystem of yours, and I do appreciate your sharing your secret knowledge. I’ll be careful not to knock down any wasp nests hereabouts! THanks again! The year before last the nest was under the light meter 4 ft off the ground, right next to my cucumbers, I had to pass thru a small opening between the raised bed and the nest to get to my cucumbers, the first few times I just went slow and steady, they watched me, one flew around me checking me out, but I had confidence that as long as I didn’t swing my arms or move unnaturally all would be well. I passed about 2 feet from that nest all summer long without a problem, sometimes I would get alittle nervous knowing for sure that there had to occas be new guards that had been born, but just had faith in their nature. The adults are just protecting themselves and the next. Gosh, I’m sorry Carolyn. I’ll try to amend that right away! I can’t seem to find the amounts of each ingredient for the soap, beer, water, and fish emulsion recipe. Did you post it yet. I’m also going to try the tule netting from my daughters wedding. Than you for the ideas. I did ask the lady for the recipe, and this is what she said: 1 can of beer, a good squirt of Dawn dishwashing soap, a quart of water, and a half-cup of fish emulsion. Honestly, though, since I wrote this post, I’ve moved to using Bt almost exclusively. It’s not expensive, one tiny bottle makes a lot (and lasts for years for my use), and it does seem to work well. But let me know how this formula works for you, I’d like to know! for those who are into re-purposing, when a friend uses yards of tulle fabric for wedding decorations, you can use that over your hoops to make a moth proof netting to cover your hoops with. Wow, amazing idea, Jane, and guess whose daughter is getting married soon? Mine! I’ll remember this! Here’s what works…. 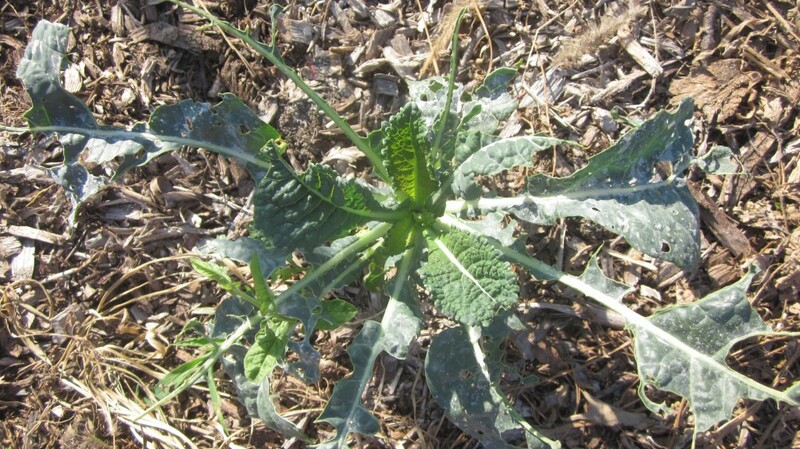 BT or Spinosad, they both kill cabbage moth caterpillers effortlessly and they are organic and don’t harm earthworms. They are liquids you mix with water and spray on the leaves. The next day all damage stops. Works great on petunias too. Thanks to these two organic garden products, the white cabbage moths are no big deal anymore. Pat, I’ve been using Bt for a couple summers now and I love it! The only downside to me is that I have to re-apply it every time it rains or I water. But I’ve also noticed that it seems to help with my new pest–the harlequin bug, too, which is awesome. Thanks for your comment! The only thing that has ever worked for me consistently are a homemade version of row covers. My husband had a roll of fence wire (about the thickness of a coat hanger) which I cut into pieces to form hoops which I stuck in the ground over the cabbages. I then visited the local second hand (thrift) store and bought a combination of stained discarded sheers and fine laced tablecloths for a price cheaper than the row covers for sale. Brought them home and secured them over the hoops by poking long nails through the cloth into the soil every foot or so. Been doing this for years now. Every couple weeks, I lift one side of the covers to check for damage and weed. Keeps them off if I get them on on time. Any way you slice it, gardening is work! Such rewarding work though.?! At times one wonders. Happy gardening! That’s brilliant, Marge. I admire your thrifty and creative efforts!! If you ever get tired of this method, do give the Bt a try. It really does work. Thanks for your great advise, I will add a bit of chilli powder to my garlic water to sort out the flies and lavas. Has anybody used a tea of stinging nettles I believe the caterpillars don’t like it. another idea with the bigger cabbage moth I tried with some success was broken up eggshells. Supposedly it looks like another moth and they won’t land. I’d like to hear about it, too, if anybody has tried this! Essential oils and DE is pretty effective against this invading insects. cheap, effective and easy to make. That sounds intriguing. Do you have a recipe to share? I’d love to try it. Which EOs, for example? I rotate Neem Oil and Safer’s Caterpillar Killer II every 3-4 days or so, depending on rain. Like most topical treatments, the sun will eventually make them stop working. So I’ll apply Neem Oil first, wait a few days, then apply the CKII. If it rains (which will wash off nearly every topical treatment), I will start the process again as soon as the plants are dry. The coverings work well, but be sure to use one fine enough to keep the moths from getting in, allow enough sunlight through, allow for air movement, and are tall enough for your plants as they grow. I wait until I have fully thinned my plants before installing the covering so I’m not constantly having to futz with it. The more work I have to do, the less likely I am to do it, so I try to keep things as simple and easy as possible. Could you please tell me what covering you use? And thank you for sharing your methods! This season I’m trying out these products. I like them so far, but if your garden isn’t shielded from wind you’ll want to take the coverings off on windy and/or stormy days. It’s a bit of a pain (especially if you lock them down too much), but if you leave them on they’ll almost certainly tear. Thanks alot for the recommendations! I’m going to check them out! I use Neem oil as well, but be careful spraying in the sun or it will burn them! For great economical covers try cheap tulle–I buy it whenever it is on sale at the fabric store or Amazon. Good for strawberries too, to keep the birds out, and squashes while the vine borers are active. Great article! Going to give the Bt a try. Great tip, Francesca!! Thank you so much. And at our house: vine borers are always big players, darn ’em!! Could you use regular house windows screen for the covered barriers? It is sold in bulk rolls. You would not have to remove it during wind and rain. That is a very interesting idea! I don’t know why not. The cabbage moths certainly couldn’t get in past it. I’m going to have to try that out, and I’ll let you know what I find out! It might be a bit expensive, but you are correct that it wouldn’t blow away during storms the way the breathable row cover potentially can. PLEASE share your impressions with me if you try it out. We get those little butterfly nets from the dollar store and attach them to a 79¢ , six foot price of bamboo. Also I noticed that sometimes the deer netting around the garden deterred a few of them. Thinking it would be good as a cover. If you want to keep deer out you need the thicker netting. It works good. The thinner stuff tears easily but is good for other things. I even used it around my house where the neighbors cat liked to potty. Just played some on the ground and cats had to find somewhere else to potty. That’s a brilliant idea, Melisse! Thanks for sharing that with us! Your description of the year round breeding cycle is an important point. For gardeners who don’t want to use poisonous sprays, this can present a special challenge, just as you shared. Indeed, Christina, and it is a challenge! Chantal, that sounds like a worthy experiment. Could you please elaborate on how to make the imitation moths? How big, how many, how, how, how, etc? Thank you, Chantal. Please permit me one more question: How do you anchor the fake moths in your garden? I just make them on a long string, then tie both ends of it to sticks. Then I push the sticks in like stakes at each end of the cabbage (or other!) rows so that they flutter above the final height of the plants. If you do successive plantings, you can change and add to the string as the “moths” get a bit tattered. Thanks, this is rally helpful. I’m about done with the cabbage moths in my garden! Good luck! They are definitely one of my most challenging pests to deal with! !